Plein Air (out in the open) paintings are created outdoors by Cheryl to capture a more raw, instantaneous ‘feel’ of her subject or to be used as reference for a more detailed painting done later in the studio. Depending on the circumstance, the paintings may be offered for sale, kept as study pieces or donated to a worthy cause. Unless otherwise noted, all images © Copyright Ceol Creations Corp.
Golden, peaceful, two fine feathered friends call it a day at a deserted spot at Myrtle Beach. 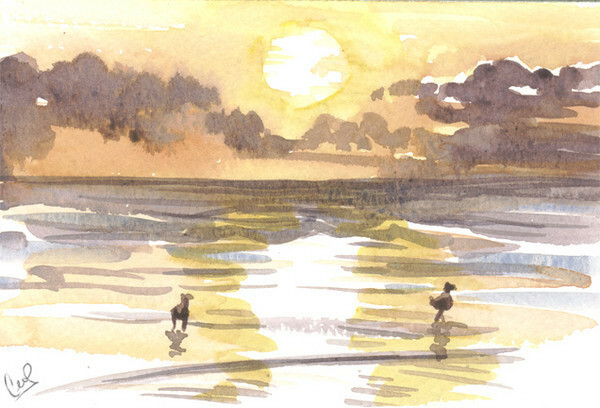 This painting was one of several watercolor postcards painted of the South Carolina shoreline. The birds had finally slowed down after a long day of food gathering and were quietly wandering along the beach, stopping now and again to look towards the ocean.